Bring back the V15 custom unit systems feature. If I use the USCS unit system in Mathcad Prime 2.0, the default length units are ft. All of my drawings are in inches. I have to change every result to inches. This is not very productive. Can you list some of the custom units you'd like us to add, or do you just want the ability to customize your own units. 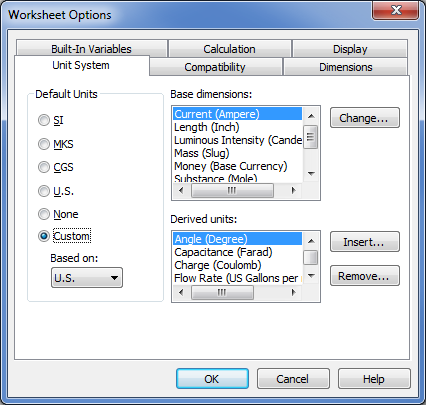 We want to be able to specify the default unit for various dimensions, just like Mathcad 15. I agree. Working in structural engineering, volume calculations are always in some form of (linear unit)^3, but Prime defaults to gallons. Given the wide range of calculations that Mathcad is used for, you'll never be able to define a single system of units that works for everyone, but if custom default units are available we just redefine the ones that don't work for us. And it's not just having to manually redefine units for every result (although that is a pretty big pain). Right now I'm working in a sheet that passes a group of properties in a matrix with multiple unit types. This is an improvement over v15 where only a single unit type is allowed in a matrix and I would have had to strip the units out to do this, but now I find when I display the matrix as a whole, I can't change the display units for the individual entries, so I'm stuck with ft and gal as my display units even though those are relatively useless for this application. Officially, PTC says they are not going to port this valuable Mathsoft feature to Mathcad Prime. See Article - CS277545. I'm not clear how "requesting" this functionality actually gets reviewed and considered. Seems intentionally vague.